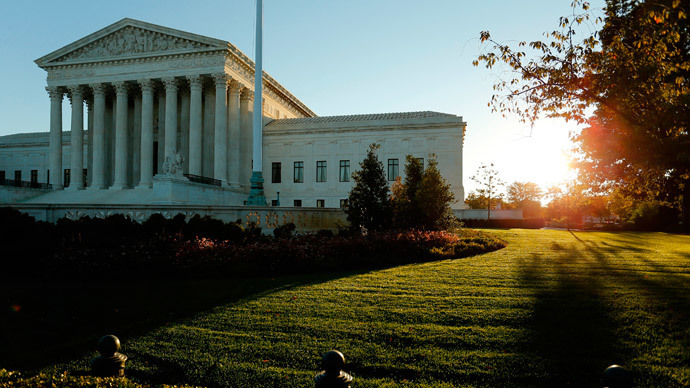 The Supreme Court agreed has agreed to hear a case about whether states must count only those who are eligible to vote rather than the total population when drawing electoral districts, leaving some to fear that minorities will be adversely affected. Justices won’t hear the case until the fall, but the lawsuit is brought by the Project for Fair Representation, a group that argues the current system for drawing up electoral districts for their legislatures violates the constitutional requirements of “one person, one vote” under the 14th Amendment. The group argues that accounting for the total population, which includes children, felons, and non-citizens, can lead to vast differences in the number of voters in a particular district, as well as differences in the power of those voters. Speaking to RT America’s Anya Parampil, investigative journalist and author Greg Palast said the lawsuit is brought by the same group whose case brought down the federal Voting Rights Act. “Back in 2013, the Supreme Court put a knife into the guts of the Voting Rights Act, making it almost impossible to enforce laws that prevented discrimination against voters of color. Here we are again – the same group,” said Palast. Project for Fair Representation is led by Ed Blum, a conservative activist who spearheaded successful overturns of the Voting Rights Act in Shelby County v. Holder, and also limited the use of affirmative action in Fisher v. University of Texas. This case is brought by Texas residents Sue Evenwel and Edward Pfenniger. It highlights a mainly rural district northeast of Houston that has 584,000 eligible voters, while a neighboring urban district has 372,000 eligible voters. A ruling in favor of the plaintiffs in Evenwel v. Abbott would grant more power to rural areas and away from urban districts, which would have enormous consequences for states with large Latino populations such as Texas. In urban centers like Dallas and Houston, 50 percent of the adult population are not citizens, according to the Brennan Center’s Democracy Program. Palast told RT America that it would lead to tremendous shift in state legislatures, and even Congress, towards the Republican Party. “[The lawsuit] takes away the vote count and Census count from districts with high minority voters, with lots of students, lots of itinerant people, and moves them to rural areas, Republican strongholds. The effect is racist. No matter how you break it down,” Palast said. It is the Census count, not the number of voters, that is used by government on a federal, state and local level to determine how much money to allocate to budgets, including everything from services for the elderly, transportation and education, and to determine the number of representatives for voting districts. “If you live in the United States of America and you pay your taxes, and you are subject to the military draft – citizen or not – your body should count. That’s the way it has always been done in the United States. We take a census of every person who has been here. It is a pure partisan grab but unfortunately the effect is quite racial, ” said Palast. The Supreme Court decision to take the case after it had been rejected by a three-judge federal appeals panel suggests it could be sympathetic the group’s argument.